Nextiva Office is a virtual IP/PBX service that can cater for businesses of all sizes. It has three basic plans that follow standard business practice with Office Pro, Office Pro Plus and Office Enterprise. The basic package comes with all the standard IP PBX business features such as it is cloud based for low cost startup and administration burden. It comes with a free local or toll free number as well as free porting of an existing business number. 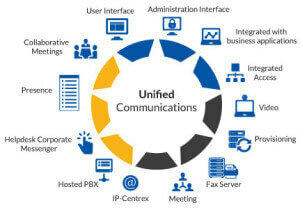 These features are to be expected, however, where Nextiva does stand out is that it offers both unlimited calls and unlimited fax. This is a big differentiator to competitors who charge both a monthly fee and a call minutes charge. 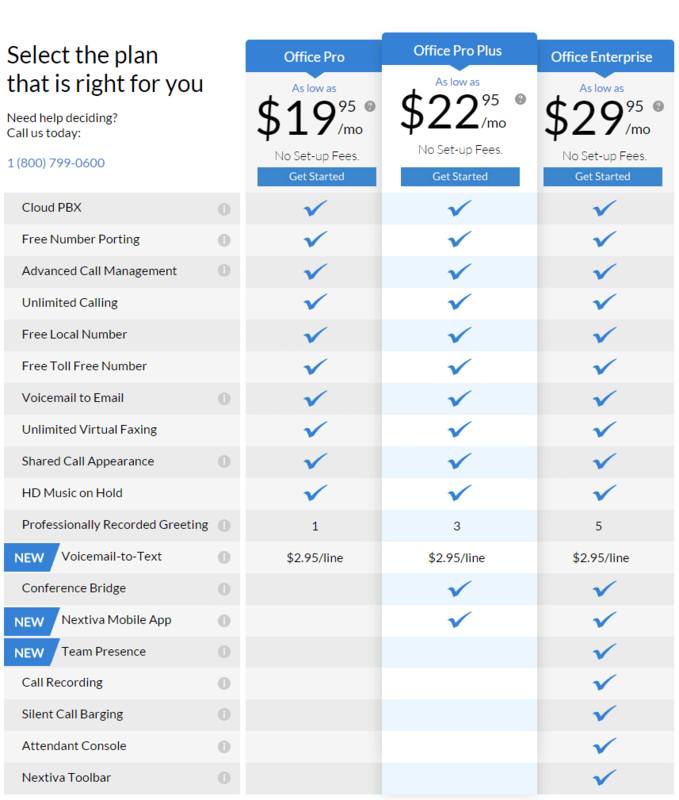 With Nextiva there is only the monthly service charge to pay and no per minute charges which is as it should be for VoIP. Additionally Nextiva Pro provides one professionally recorded greeting and provides HD music on hold. Voicemail is standard as is voicemail to email, whereby a sound file of the voicemail is send to an email address of your choice as a .wav file. Moreover, there is a voicemail to text service but it is charged at an additional fee per line. At the time of writing (Sept 2014) Office Pro starts at $19.95 and has no set-up fees. Pro Plus is the intermediate and most popular service as it is targeted at the small to medium business, which has more requirements with regards features. For example, Office Pro comes with everything than Office Pro has but in addition, it has advanced features such as a conference bridge that can support voice and video calls. It also comes with the Nextiva Mobile App which combines voice, video and IM into a single converged communication application. However apart from these two additional features there is little to justify the higher price as both voice/video call conferencing and a Softphone application are common and freely available applications on most competitors service plans. Office Pro Plus starts at around $22.95 per month. Team Presence, whereby you can adjust your availability settings and status and display that to colleagues as well as see their status. Call Recording, which is a feature that permits recording of incoming or outgoing calls. Silent Call Barging, which allows managers to monitor calls and take over a conversation if required, this is useful in training and mentoring. Attendant Console, provides a means to monitor and view the status of all and user information in real time and see who is busy, available or away from their station. Nextiva Toolbar provides a means to integrate and make calls from your browser or from Outlook. As with Nextiva Pro-Plus, it is hard to see the justification for the price rise when considering the usefulness and value of the additional features. Most of these additional Enterprise features are commonplace in competitor’s basic plans though this is probably due to the way Nextiva have segregated the rich call center features for their Call Center product. At the time of writing Nextiva Office Enterprise is priced at 29.95 per month. This is a very interesting product because Nextiva is one of the few vendors that actually provide a specialized Call Center version. Most simply bundle the features in with their top end business product but here Nextiva have created a separate product and tailored it too suit call centers for both medium and large businesses. This is the entry version and it comes with a rich feature list to support all the business functions of the Front Office, Business Integration, Supervisor Controls, Quality Assurance and IVR. Call Center Pro has all the basic call center features you would expect such as call queue visibility, enhanced greeting and queue announcements, voice/video conferencing, one click transfers, and Night & Holiday service announcements. 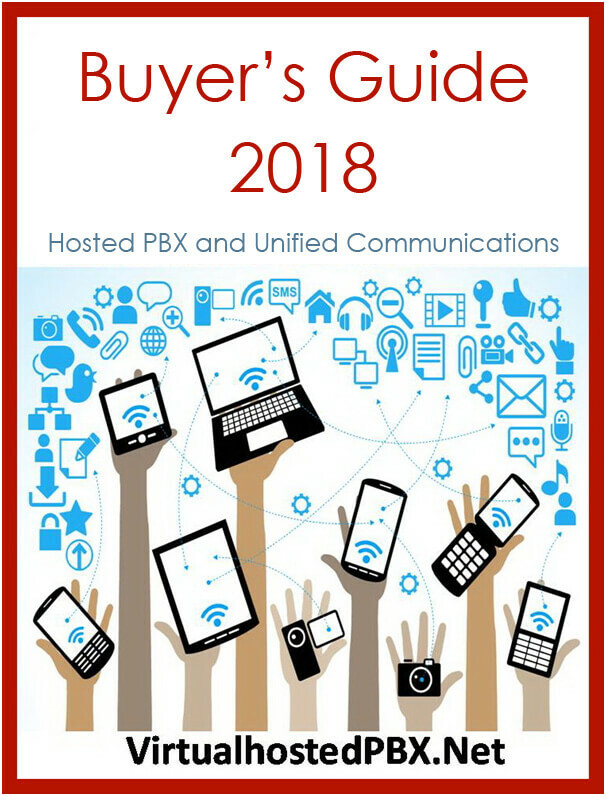 These features are really, what differentiates call center applications as most PBX has the same features it is how they integrate with existing business applications that make the difference. An example is CRM integration, which is essential in large and busy call centers. CRM integration allows a caller’s call history record to be opened automatically on the agent’s screen as they answer the call. The call center agent then has all the relevant details on the screen as they greet the customer. Outlook integration is also an important tool for integration, as caller identification numbers can be paired with a caller’s contacts information. Other useful Call Center features are skill-based routing, which can be used to configure call queues to be answered by the most suitable agent. There is also remote agent support, which allows for remote agents to work from home or other locations yet have the same visibility and connection as their office based colleagues. These features differentiate Call Center from other business features as they provide the means to monitor and manage agents, clients and calls through real-time supervision and management tools. On the standard product, there is real-time management via dashboards and reports, by Time, Call, Agents and Queues. In the Enterprise version, there are additional queue supervision and management tools as well as call recording and silent Barge-in for agent mentoring. In the standard version, these features include call analytics, custom reporting, and agent scoring. In addition, the Enterprise version supports priority queue routing, outgoing call control and DNIS support. Addition Features – at a price. This is a major disappointment with the call center product as the Supervisor Dashboard should be available and come as part of the Enterprise Call Center product at least. A supervisor dashboard is crucial and a vital component of any call center product, it is not an accessory. Similarly, to the Office product range there doesn’t appear to be any real reason why they have kept some pretty basic features for the Enterprise version only, such as auto-answer on a Night & Holiday Service, outbound call management or queue call management, neither of which are killer apps in fact they are basic requirements of any professional system. For a system that is marketed directly as an Enterprise Call Center solution these are major failings, as they should be standard as should comprehensive custom reporting and analytics, not to mention a wall board and heads up display facility. This is the incoming call management virtual service for small business and entrepreneurs. Inbound call management is very popular with business startups and those who are mobile both in the way they work and on the phones they use. Nextiva Connect like similar solutions provides a business local or toll free number to be used as the business number that customers will call. Nextiva manages this number and auto-answers calls and provides the caller with a menu of options. The caller can select an extension, for example, 1 for Sales, 2 for Finance … and Nextiva will divert the call to a pre-configured mobile or landline telephone. Of course, many other incoming call providers provide the same facility and it is not something that other providers such as Grasshopper and RingCentral are not adept at. Therefore, it isn’t really a major differentiator. What is a difference is the fact they offer SIP Trunking. SIP support and SIP trunking allows you to invest in cloud-based communication. There is massive support for making free and national/international calls. After all it is VoIP and therefore easy to connect to any Asterisk or VoIP system and what is more for free. However, there is always Nextiva Fax plan. The Fax plan comes unfortunately as 500, 1000, and 3000 pages again this should be free but Nextiva decide it is a way to charge extra. At current prices, they are charging $4.95, $12.05 and $29.95 per month the costs all add up so it is not cheap; however it does come included in Office Pro. 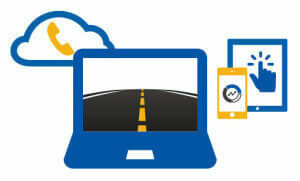 Nextiva is a very good virtual PBX system with many great features and specializations. However, it lacks required features and functions that are necessary for the price. Other competitors can deliver rich features required by medium and enterprise clients. Its benefit is as a business phone system where call per minute is irrelevant and only one monthly charge applies. As a Call Center product I am not so convinced, and it needs to do much more to integrate all the required features into the call center packages as default. As for Nextiva Connect, it is just a standard no frills inbound answering service that really does not stand out from the competition. Nextiva App is a good add-on but these applications are so common now that they are not value add but a requirement, therefore it really doesn’t boost or diminish the overall PBX service. Nextiva is a sound package and very professional service however it lets itself down by the way it segregates its services and forces customers into upgrades for features that should be standard issue. Visit Nextiva.com to signup and for further information. We are very happy with Nextiva. We had issues with our previous phone system which was actually hurting our business due to customers not being able to reach us at times. We have only had a couple issues with Nextiva, but each time a support representative has been able to fix them in under 10 minutes. The customer service is outstanding.